Sneaky, Devious, Guileful, Slippery — a Thief! Tricky, foxy, covert, furtive, stealthy, underhanded, sly, shifty, duplicitous, scheming, shady, shifty, sly, wily . . . So the story begins as I observe a coyote eating something big. It’s raining, and not only that, the rain has seeped into my lens. I keep wiping it dry, but focus is an off and on thing on this day with the rain and the damp lens — I wonder if any of my photos will even turn out. Soon I see that he’s being observed by one of his youngsters — his full-grown daughter — she keeps away. Eventually I’m able to make out the ringed tail of a raccoon — this is what he’s been eating, and this is what Daughter has been watching him eat. After about 20 minutes, Daughter, and then Dad, move on to another area of the park. It looks as though the raccoon has been forgotten for now. They keep their distance, but constantly observe each other, in a way that makes me think each is suspicious of what the other is doing: as they move along, they circle back and forth while darting furtive glances at each other. I can feel the suspicion and distrust — there’s duplicity in the air. When a runner comes through, this pattern of behavior is broken and they run in opposite directions with Dad scurrying over a hill and Youngster ducking into some bushes, both disappearing from view for a short time. When I next spot Dad he is carrying something which looks like a thick wet stick. But no, as I watch I can see that it’s more important than a stick: he looks like he’s carefully transporting it. And then I see it’s part of a raccoon — a piece of his earlier meal — the “drumstick”, so to speak, with a very distinctive raccoon paw still attached. I’m the only one around, and he lets me watch. He walks some distance, then stops, darting glances in all directions, obviously scanning for a place to bury his treasure. He stops on a rock and focuses intently on various possibilities. He glances at me a couple of times, but continues his search. No, this place won’t do. So he heads to a grove of trees close by and begins looking around there for a safe spot to deposit his possession: “This looks good”. He finds the perfect spot and spends time creating a little depression with his snout, deposits the drumstick into the depression, and then covers it with leaves, again using his snout. He pees on it and then he trots away, looking around as if to make sure no one important has seen him. Daughter now comes into view up the path that he’s on — Dad and Daughter pass each other and move apart — 2 ships passing in the night. They stay apart, but watch each other as they sniff the ground. It’s the same little pantomime dance between the two of them them that I saw earlier of avoidance and suspicion — I’m probably reading it this way because I know about the hidden drumstick. Dad then, nonchalantly as if he has nothing to hide, heads up to the top of a hill and sits down to observe, possibly to throw Daughter off the track, possibly hoping she’ll follow him there. But nothing escapes her, and her nose picks up the scent of Dad’s earlier route and probably the raccoon. She follows the scent, and I follow her. But she passes right past the burial spot without going over to it, so I go back to check on Dad who has not moved. When I come back, half a minute later, I see that I’ve missed “the discovery”: Daughter now has the drumstick in her mouth! Didn’t Dad see her take it? I guess not, because Dad is sitting oblivious of the situation at the top of a hill behind some trees. Youngster now does what Dad did: she trots away some distance and then glances around for a safe burial spot, finds one, and buries the drumstick. Ahhh! Now it is hers. No, the story is not over yet! She now wanders back to where she had unburied the drumstick — maybe she’s looking for more of the same? This, now, is when Dad sees her close to where he had buried the drumstick. Dad runs down the hill towards the spot. She moves away then watches him. He moves towards his burial spot and sniffs around. Is he aware that it’s gone? If he is, does he know who took it? He pees various times on the spot. Finally Daughter joins him and they both appear to explore the area together! What are they looking for? Is he searching for his drumstick. She may be searching for more of the same — or is she deceiving him and pretending that she’s looking for whatever he’s looking for? It’s confusing, but these thoughts occurred to me. It is during this joint exploration that the suspicion and avoidance seem to have faded away. They trot off together and all seems well between them. Thieving, apparently, is common among animals. I recently read that Robins steal from each other and hide things from each other! The next day I checked out where Daughter had buried the drumstick. It was gone. I wonder who was the slyest trickster of the two?! Most cities seem to leave it to individuals — not even larger neighborhood groups — to trap and kill coyotes as they see fit. Folks have long been taught that killing them is the way to manage them, even though it has been proven that this results in higher and younger populations, and fewer stable families to keep other coyotes away. In some places a permit might be required at certain times of the year, but usually not, and sometimes a reason is required to get the permit — including that the coyote was a “nuisance”. In one community, coyote yipping sounds were deemed a “nuisance”. These protocols seem to be the norm. There is no education behind them. Few cities have actual written “coyote management plans”, such as the plans in Vancouver and Denver. More cities have informational websites offering the standard guidelines and explaining that killing coyotes doesn’t work — again, folks are free to trap and kill if they want to in these communities. Here in San Francisco trapping and killing are not permitted, but we do not have a written coyote management plan per se, because it was deemed unnecessary. A coyote organization attempted to push its plan through in San Francisco — a plan that included extensive hazing — which the San Francisco Animal Commission wisely turned down. Coyotes do not need to be “hazed” whenever they’re seen — it can be counterproductive. See below. What works here in San Francisco is educating the public about coyotes and their behavior and giving folks guidelines which will prevent conflicts and other issues. I’ve helped convert many folks to a positive mindset just by telling them a little about coyote family life and iterating the guidelines with some one-on-one help on knowing how to shoo one off. Coyotes do not approach people unless taught to do so with food, so feeding of coyotes is forbidden, and folks are taught not to leave food attractants out in their yards. As everyone should know, pets are the main issue of concern, but this is an issue which can be easily managed by not allowing pets to roam free, and by leashing and walking away from a coyote the minute you see it. Basically, what the authorities have been saying here in San Francisco is, that if a dog is bitten by a coyote because the dog was not leashed, or if a cat is taken because it was allowed to roam free, it’s really the owner’s fault and could have been prevented by following the guidelines — please take better care of your pet. This protocol is the only way to make coexistence work: it’s easy, it’s effective, it’s responsible, and the burden of responsibility is on the pet owner to guard his/her pets. I would like to add something here. . . . In my opinion, some of the “expert” information out there is counterproductive and remiss — it’s actually hurting coyotes and increasing fears in humans. For instance, “hazing” — mostly noise and erratic movement such as arm waving — is promoted as a cure-all which will cause coyotes to flee. But as I’ve seen here in San Francisco, and as we’ve seen in several cities which have now returned to trapping, for example in Seal Beach in Southern California, coyotes can get used to this and begin responding to it more slowly or even ignoring it. The big problem then is what this does to people’s perceptions about coyotes: folks are under the impression that if a coyote doesn’t flee quickly when hazed, that it is therefore “habituated” and that it now poses a danger to the community. This is not so. Folks have been taught that a “habituated” animal is a dangerous one. This, also, is not true. Because of what has been taught incorrectly about habituation, folks feel that if they simply see a coyote, or if it doesn’t flee quickly upon seeing a person, it must be habituated, or on its way to becoming habituated, and, therefore, to becoming dangerous. Where does this come from? There is no science at all behind it. Telling folks this is increasing their fears. So teaching that “hazing” is a solution has actually backfired. We all need to become aware of coyote behaviors so that we can know how to prevent issues. Yes, coyotes don’t like canine intruders in their territories: they even don’t allow non-family coyotes in. All canines, be they wolves, dogs, foxes or coyotes, don’t really like each other and all will exclude the others, as well as members of their same species who are non-family members, from their territories. This is instinctive behavior. We can’t really change their instincts for survival, but we can learn about them and understand them, and modify our own behaviors, so that all of us — human, cat, dog, coyote — can coexist. The guidelines are few and simple. The other instinct driving coyote behavior is a food drive. We all need to eat. Coyotes normally hunt small rodents, but they will look for free food which they may find on their wanderings, and they may grab a small pet if the opportunity arises — it happens very infrequently, but it has happened. So, hey, let’s not let those opportunities arise! Keeping your cat or dog away from coyotes is easy. Roaming through their territories as they visit their hunting spaces is another instinctive behavior. Everyone should know that, by doing so, coyotes in fact are preventing other coyotes from moving in. By the same token, you may sight them now and then in your neighborhood. Most importantly, coyotes avoid humans. In most urban areas they’ve altered their schedules to avoid us: they are active mostly at night when we are not, even though they are not nocturnal animals. What actually needs to be taught is that habituation is normal: all animals become habituated to sounds and movements in their environments. It’s okay, and even fun, to see a coyote. This should not cause fear. We should be shaping the overall mindset of folks to think more positively about coyotes. And we need to teach that coyotes are wary — not fearful — of people: they’ll do their best to avoid us, even if they might not flee as quickly as someone might want them to. All habituated coyotes retain their wariness of humans. It is feeding coyotes which should not be allowed. This attracts coyotes to yards and brings them closer to people — they could become demanding. Attractants of any sort should be eliminated from yards: you don’t want to invite them to visit, and you might even want to discourage them by shooing them off if you happen to be there. Shooing off a coyote should probably be reserved for when one has entered your yard, or if, for example, you need to get to your car and it happens to be standing too close. Avoidance however, is always the safest strategy: this goes for whether you see a coyote in the distance, coming towards you or if it’s already underfoot — leash your dog and go the other way without running. The elderly, children and those who are afraid should not feel they need to haze or harass a coyote. Walking away accomplishes what is needed: the coyote’s entire intention in approaching is to move your dog and you away. So, do it! Vulnerable smaller dogs which might be viewed as prey should be picked up and walk away. Everyone should be taught to respect a coyote’s space and keep away from it. It is normal to see coyotes in parks, but dogs have to be kept far away from them. Please see this flyer for detailed information on how to handle coyote encounters: PRESS HERE. Because of territoriality and because small pets are often seen as prey, but also because pets may be seen as an annoyance to coyotes — the presence and activity of small pets can be interpreted by coyotes as harassing or challenging them, so it’s not always about predation — it’s really important that folks guard their pets: keep pets from roaming free, leash pets in coyote areas and especially after spotting a coyote, don’t let pets chase coyotes, don’t leave food and other attractants out in your yards, know how to handle encounters. So, guard your pets carefully! Remove food attractants from your yard. Notwithstanding, on occasion, you may see a coyote pass through the area — but that this should not be cause for alarm. One of the problems in some communities is that the only option they are taught to use to deter coyotes is “hazing.” In some instances, when “hazing” may no longer be effective, because coyotes have become “habituated” to people and/or hazing, residents may see coyotes linger longer in their yards. When this happens, the coyotes are sometimes, incorrectly, perceived as “aggressive and dangerous”, as they have been in Seal Beach, California. Of course, those who have an informed understanding of “normal” coyote behavior know that habituation does not mean aggression — it just means that the coyote has become accustomed to seeing humans — and does not in any way indicate that the animal will react “aggressively” or that it is in any way a danger. Here is an example of irresponsible and counterproductive behavior by humans. I’ve been keeping track of a particular group of dogs in one of our parks in San Francisco whose owners don’t leash-up and who allow their dogs to chase after coyotes. Fascinatingly, it’s this group of dogs — almost certainly because of their hostile and antagonistic behavior towards coyotes — that the coyotes watch and monitor. These dog owners feel that coyotes are a nuisance, but it is their non-compliance with leashing guidelines and allowing their dogs to chase coyotes which makes these dogs subjects of interest for the coyotes. 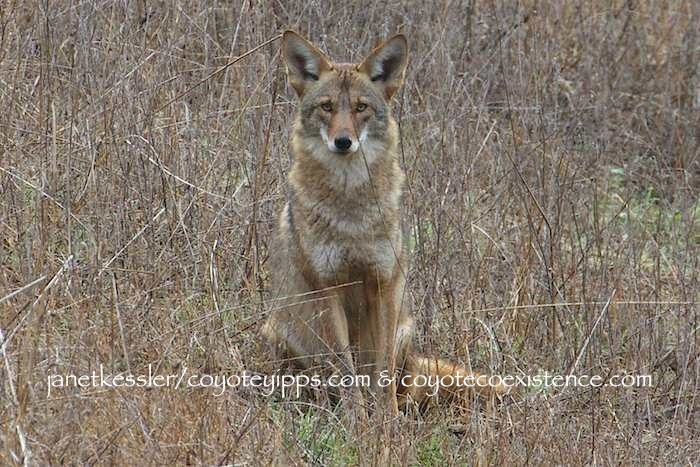 The owners have, in effect, been allowing their dogs and the coyotes to engage and interact. It’s our responsibility not to allow any such engagement: the repetitive cycle can be broken by leashing the dogs. Other dogs in this park are leashed-up and walk on, and, not surprisingly, these dogs and coyotes leave each other alone. To capture the behaviors I’m looking for, I often keep my face glued to the camera as coyotes interact. This way, I catch extended sequences, not only of a particular behavior, but of what went on preceding and following the behavior, all of which help make sense of what I see. Today I was taking a break from holding up the weighty camera — my camera is always hand-held and can get pretty heavy after a while, and of course, THAT is when I heard a yelp — the same cry a dog makes when it’s been bitten by another dog, only there were no dogs around, just coyotes. It’s a sound I hadn’t heard before from coyotes. Dusk was well on its way to darkness and I was some distance away, but I quickly focused as best I could on the two sibling coyotes who had been hunting together. What I saw surprised me because it deviated from what I had been seeing. The male youngster, with teeth bared, was standing over the female who was on her back, breaking the established hierarchy. And I knew why: the female often is right in the others’ face — something she’s been getting away with way too often: I’ve concluded that she’s been granted special status because of being a female — the only female — in this particular family since her mother died. Dad enforces the ranking always. Dad is the leader and alpha. Daughter seems to have a dual ranking in relation to Dad: she is below him ultimately, but he allows her a certain equality and is tolerant of certain of her behaviors when it comes to personal interactions. For instance, she is allowed to put her paws on him whereas neither he nor Son ever put their paws on her or on each other. And Son, low man on the totem pole, must submit always to having Daughter put her snout around his. As I said, Dad is often around to enforce the rankings, but even when he is not, the established ranking is adhered to. Why Daughter has special status may be because a female is needed in the family — Dad doesn’t want her driven out, and there seem to be matriarchal aspects to coyote families. In this family, her special status has been ceded to her by Dad, and Son abides by Dad’s dictates. But Dad wasn’t around today when the incident occurred. Daughter was bitten because she was too much in Son’s face. Son had found something in the ground and had been intent on keeping it for himself when Daughter came up and stuck her nose in his work, making a nuisance of herself. Angry Son reacted in a flash, biting her and putting her on her back where she was kept for a minute. She then got up, ducking out of the way and continued to watch, again, from too close. For this she was growled at again, but not nipped again. But the squeal of pain that I heard was apparently also heard by Dad, who had been sleeping in a thicket not far off. 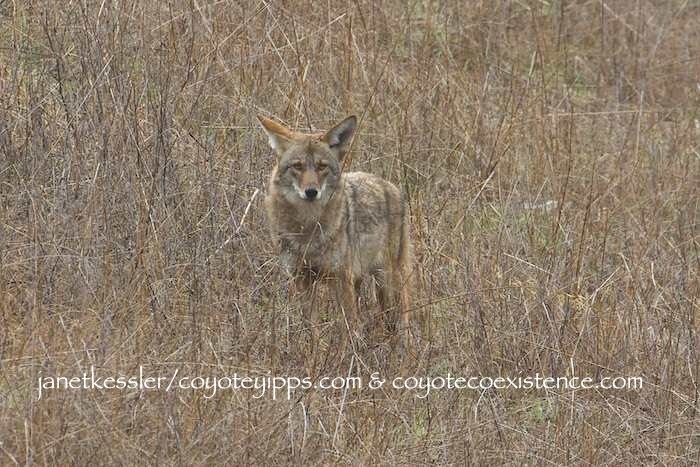 Both youngster coyotes, with their very fine hearing, heard him and looked his way immediately when he emerged from the brush. Daughter, submissively, with ears back and a crouching, crawling gait, hurried towards him. She might as well have been saying: “Daddy, did you see what he did to me?” as she greeted him submissively. Dad charged towards the son with tail straight out and hackles up: he was not happy with the altercation. He was not going to tolerate dissension in his family! He forced Son on his back and made him stay there a few moments, enclosing Son’s snout in his. Dad turns to growl at Daughter — maybe he’s had it with both of them? Surprisingly, Daughter had to kowtow to Dad also this time. Maybe Dad is more even-handed than I thought, and maybe Daughter is, usually, simply a little quicker to submit to him. However, in front of Dad, who was now there to protect her, she grabbed her brother’s snout in hers, reconfirming her superiority to him. Soon the two were allowed up, and all three coyotes continued to hunt, but not before Daughter again lay on her back in front of Dad, letting him know that she knew her lower status next to him. In this case, I don’t think she was doing it for her brother’s sake to divert attention away from her brother as I’ve seen so often — as much as for her own! Please sign the petition by the Endangered Species Coalition to put an end to Wildlife Killing Contests in California for good. The California Fish and Wildlife Commission will be making a decision on this issue on December 3rd of this year. I am writing you to please put a halt to the coyote killing contests in California, be they killing derbies, competitions, tournaments or roundups. This is a violent and sickening practice which has to be stopped not only in California, but throughout North America. Wholesale slaughter for fun, entertainment, and money, is barbaric and it besmirches us as a society. It is shameful and offensive that the state is permitting a small group of killers to indulge themselves this way. The vast majority of folks are shocked that it is going on, and incredulous that it is even legal and being allowed. The wildlife in the state belongs to all of us — we must be their stewards and protectors, not their brutal killers. Please STOP THE CONTESTS NOW and put an end to it for all time! Science has shown that mass killing of coyotes accomplishes absolutely nothing as a “management” tool: when there is wholesale slaughter of this type, coyotes quickly rebound and even increase — so the bloodbath serves no “management” purpose whatsoever. In addition, all animals have a function in our ecosystem, and coyotes are no exception: they keep rodents and mesopredators in check, helping to maintain a healthy and natural balance in the environment — nature always balances itself and we should allow it to do so. Beyond their ecology and reproductive biology, coyotes are one of the few species — 3-5% of all species — who mate for life and have intense family lives. The State should be helping folks get to know about them and appreciate them rather than kill them. Please put an end to the coyote killing contests — ban them now and forevermore! Kathy Dowell is running the campaign to stop a coyote killing contest in her county of Grayson, Virginia. She is doing so single handedly with aid from Coyotecoexistence.com of which she is a team member. Kathy has passion and dedication, and she is the one doing the footwork in this campaign — it is her campaign. Besides distributing flyers and posters, putting up a petition and gathering signatures, she has written letters and, most recently, she has gotten her information out through the newspaper. She plans to attend the next meeting of the Board of Supervisors and she is looking for like-minded individuals in Galax to help her with her campaign. Kudos to Kathy, and thank you!! You are a wonderful role model for us all! 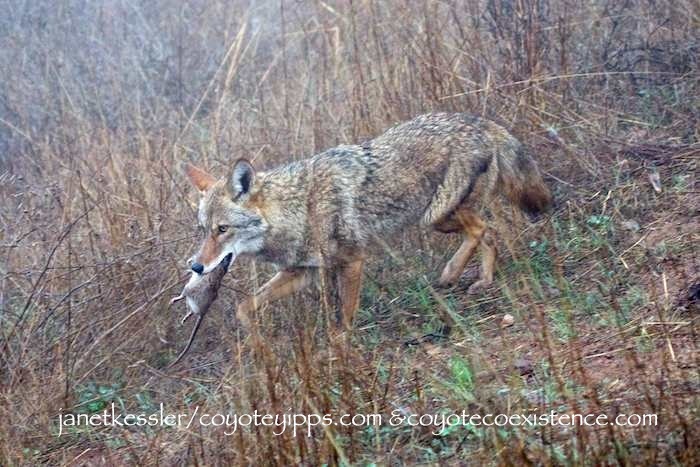 We’re proud to have you on the Coyotecoexistence.com team and we’ll keep fighting in this effort until we get it stopped and we’re hoping others will chime in! It’s important for folks to know what is normal, mundane, coyote activity, and this posting is about just that! Today I saw three coyotes out lolling around aimlessly in the darkness before dawn: one hunted casually and one wallowed on something — no doubt something smelly. It was before daybreak so I could just barely make out their movements in the near distance. Within minutes of my spotting them, their activities suddenly acquired direction and purpose. They all jetted off quickly in a bee-line. Because of the lack of light, I could not see which of the three led the brigade, or if, somehow, they all mutually understood and knew what they would be doing for the next little while. Had they heard the first dogs and walkers entering at the other end of the park, about 1/3 of a mile away? I hadn’t, but coyotes have much better hearing than we do, and this is what may have set them off. The other two coyotes stopped right there where they had emerged from the dense bushes — they went no further. They were on a little knoll from which they could watch and be watched — from a safe distance — by passing walkers and their dogs. They settled down and simply watched. A few dog walkers and their dogs trickled through, some seeing the coyotes and some not. Even the one group of walkers which normally harasses and antagonizes the coyotes leashed-up this time and went by without incident: their dogs did not chase the coyotes today. It’s this group that I think the coyotes were out messaging their presence for. Eventually a couple of dog walkers, without initially seeing the coyotes, headed up the path directly next to where the coyotes were hanging out — the coyotes stood up in preparation for flight. But, upon seeing the coyotes, these walkers leashed their dogs and turned around, and the two coyotes settled down again to watch. They watched this couple of walkers distance themselves and then release their dogs from their leashes as they moved away from the coyotes. Then first the youngster coyote, and then the older one, got up and ran in the direction of these two dog walkers and their dogs — they seemed to be pulled by their curiosity about the dogs who now had become extremely active off-leash. The younger coyote has been engaging in this pattern of behavior recently: running in the direction of particularly active dogs to watch them, but never approaching closer than 50 feet and never showing any hostility — just plain interested and curious. The dog walkers spotted the coyotes approaching and quickly leashed their dogs again. Coyotes, dogs and walkers all stopped in their tracks to watch each other from the 300 foot distance which separated them. All was still and calm. After a minute or so, the walkers walked on together, and the coyotes, too, came together, touched noses and wandered slowly back to where they had been and then into the bushes. I have now seen this behavior many times: the coyotes had headed out on purpose to see and be seen by the dogs — to assess and update themselves about the dogs coming to their park — possibly very specific dogs — and to let those same dogs know about their own presence and territorial claim. Later on, that first coyote who had headed up the hill and away from the others returned to where I had first seen her before dawn. As she hunted, the younger of the two other coyotes, her sibling, walked into the field with a purposeful gait, obviously looking around for her. They found each other, touched, and ended up hunting a little together and then a little apart before one and then the other disappeared into the bushes for the day. This is coyote family life in the big city, and it has purpose and direction!